I thought I would share this link with you readers, it is a cool idea for a great weekend project. It's a great way to make a fashion statement while being green! The following is a profile article written by sophomore Journalism student, Randi Stevenson. Erin Browner shifts through her stuffed drawers and color coordinated closet looking for the perfect shirt to compliment her new skinny jeans and vintage earrings. Waking up with nothing but style on her mind, this young fashionista has made it a priority to study hard, pursue what she loves and look fabulous all the while. “ I wanted to get away from home and create my own life where I could create my own path,” the freshman said about leaving her hometown of San Carlos, Calif. to study at the Walter Cronkite School of Journalism at Arizona State University. After four years of setting trends throughout the halls of Carlmont High School, she decided that it was time to truly run with her passion. Browner dreams of one day being the fashion desk editor at a large magazine or the New York Times fashion and style section; however, she could also see herself working in public relations somewhere in fashion market. Browner’s earliest icons date back to Audrey Hepburn, as the poster hanging in her room proves; but she admitted to having a new guilty pleasure. Erin’s roommate, Chelsea Vmystir, said that she loves being roommates with a fashion goddess because she always has unique ideas about what to wear. “She also has exclusive veto power if I put on something terrible,” Chelsea added. Besides simply reading about and indulging in style every chance she gets, Erin also founded somewhat of a pioneer in the industry as well: ASU’s first fashion journalism club. As a current freshman, Browner took it upon herself to gather members, create a website and build the club from scratch, with hopes that the organization will inspire fashion lovers to join and not feel pressured to go into hard news. “I started it just because I was interested in it, and its objectives so far are online blogging and brainstorming ideas. I even have a few professional speakers scheduled,” said Erin. Between living and breathing shoes and bags Erin Browner said she considers her life made, but with her new found love for sundresses and flats, her mornings are filled with harder decisions every day. Tom Ford was born in the State of Texas but had lived most of his childhood in Sante Fe, New Mexico. While growing up Ford moved to "The Big Apple" to attend New York University and enrolled in classes that had pertained to art history. Later, he altered his studies towards architecture and later enrolled in Parson's School of Design in New York City and Paris. As the years continued to progress, so did Ford along with his job offer with Gucci in Milan, France as the company's women's wear designer. Not too long after, Ford stepped up further with his career by becoming Designer Director. Shortly after that, Ford was positioned as Creative Director for Gucci. His job entitled responsibility for all aspects of the company such as designing all the new lines of clothing, perfume, as well as the advertising of the company and the company's building design. The following years at Gucci were nothing but success for Ford. He has been labeled one of the most successful men in the fashion industry. Gucci then opened another line of clothing, Yves Saint Laurent (YSL), which was established under the guidance of Ford's consistent success with Gucci. Ford then had the duty of working with the design team of YSL and helping them with defining a signature image of the company. Ford finally removed himself from the Gucci to establish his own company, TOM FORD company which continues to thrive with his launch of his signature fragrance, the TOM FORD FOR MEN in 2007and partnership with Marcolin Group for optical frames/sunglasses, which have been helpful for his stability for his company for a fresh start. Ford then partnered with another group, Ermenegildo Zenga, for the production of men's luxurious ready to wear clothing, shoes, and accessories with the TOM FORD label. Ford received numerous awards after his achievements. He earned awards with dedication and passion for his skills in fashion, business, and creativity. To me, Tom Ford is today's Fashion Designer of the day. Until next time this is Eric Lomahaptewa, future well known Native American Fashion Designer. Baring bellies are out…as in way out. Cover them up with a huge waist belt or high right jeans. High-rise is back in style ladies! This is great news for people like me, who have a curvy body. It’s time to accent tiny wastes and voluptuous hips again. Feeling a little straight hipped? Head over to one of the Yogalaties classes at the YMCA. Yoga and Pilates strengthen the very inner muscles of your core and shape you up to make all the newest styles fit perfectly. Working down, open-toed shoes are absolutely out-especially for the winter. Unless they are the new open-toed ankle boot or the overly strappy (and equally slimming for the ankle/foot region) stiletto pumps. When you’re spending the night out go for the high-heeled boots, or in the afternoon a small heel if none at all. Closed toed shoes will keep you about 10 degrees warmer than an open toed heel. So definitely opt for the closed toed boot if you’re going to wear a skimpy love-top under a light-weight jacket. Ps: the higher the boot, the longer and leaner your legs look and the shorter the boot the smaller your ankles appear. Since we live in Arizona, don’t put those dark and warm-colored, short dresses into the back of the closet just yet. Pair it with a crop jacket, tights or leggings, and any boot (just make sure the legging or tight goes all the way into the boot-resist the 2 inches of bare leg!). Still think you’ll be a little chilly? Grab a scarf and wrap it around your neck. Scarves have about the same temperature effect as closed toed shoes, you’ll be surprised how warm it will keep you! Colors are pretty much all over the board this year. The designers kept them bright and bold, but don’t get too out of hand. Keep the baby blues and soft pinks in the drawers until Spring and stick to as many warm colors as possible. Purple seems to be the nations favorite as of now. It’s eye-catching yet subtle, and it truly brightens every skin color. Jewelry is staying bright and flashy too, but designers are scaling down to one key piece instead of a lot of chunky ones. Tip: long necklaces are still loved and gold is back! Here are two situations that seem like a bad hair day abyss, and my solutions to both. What?! Your alarm was supposed to go off twenty minutes ago! You jump out of bed, hop in the shower to rinse, brush your teeth, throw on a tee-shirt and jeans and then remember that hot guy in your first class and dread the thought of him seeing you this sloppy. You glance at the clock, seven minutes until class, no time to blow-dry. So you split your hair vertically in the back to create two sections. 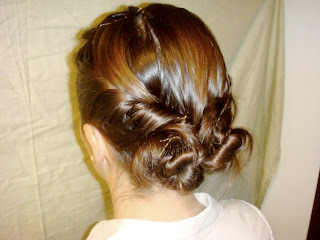 Twist and bobby pin the sections into two small cinnamon buns. Your towel-dried hair is still styled and looks pretty, instead of the usual messy bun or ponytail. You don’t know what caused you to toss and turn in bed last night, but your hair looks like a hot mess! You don’t have time to style or wash it before class, and you are sick of those messy buns. An easy solution to bad hair days is the revolutionary braid. French braids, side braids, or braids into a ponytail. Or, my personal favorite, French braids on each side of your head into a braided side ponytail. It’s a classy look and keeps your hair out of your face. Plus, you don’t need to bother with straightening or curling your hair, taking another shower or just throwing it up. What are your bad hair problems? Let FJC know in a comment, and we will be more than happy to respond!